In this thread we post some pictures of ourselves as we go along in our journey. I had other progress pics on page 5 of this thread, but I found newer ones that I thought were better. The one on the left is me at my Senior Prom in 1999. The one on the right is of me singing karaoke back in February of this year. 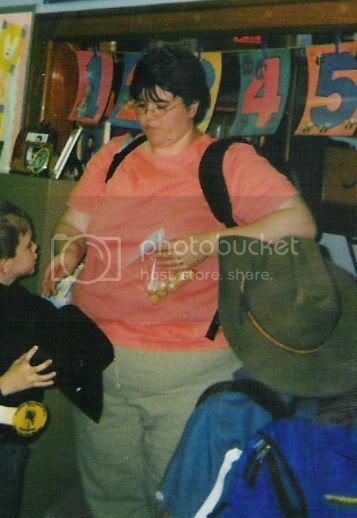 Come see what 75 lbs looks like before and after! Like many, I avoided the camera so had a hard time finding a good before pic. This is from a family pic. I didn't use this one as there was another where I looked less fat lol. 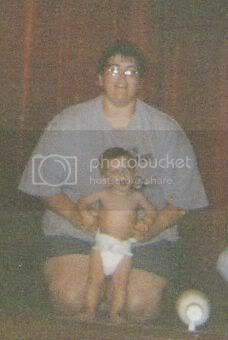 I tried to take a progress pic after Robyn was born but I thought I looked fatter than when I was pg. I was pretty dissapointed. A couple weeks ago I had to buy some pants. My old pants were looking goofy as they had gotten so big. Or I had gotten too small for them lol. Since I had obviously shrunk I decided to try for another progress pic. The first one I was wearing a sweater but I could tell it was hiding a waist so I got dh to take another. I was happily surprised by what I saw. He took a side shot too. In that one I look like an average person but a 5 mos pg average person lol. The morning the picture was taken my weight was 193.4. I've lost over 78lbs! Not very long after I lost 100lbs. I've since had another baby and I'm working on losing the last 5 again. Ok here is my first ever before and after pics!! I am totally embrassed of these pics but they are my life! So tell me honestly if you can tell a difference!! 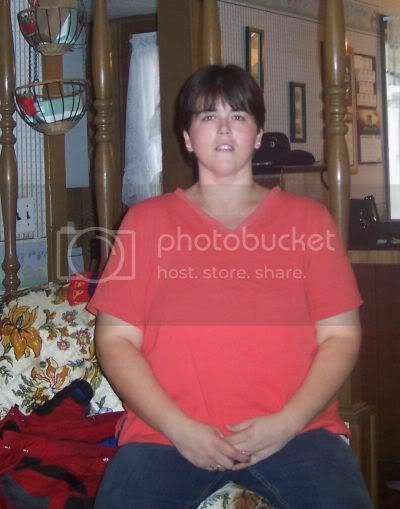 Me before at 323 pds yes 323 pds!! 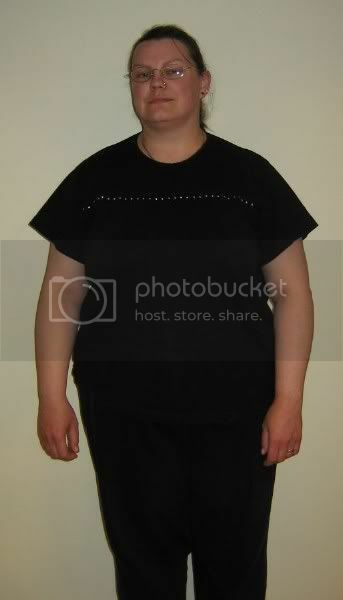 Me now at 250 pds a 73 pd weight loss! I've been having trouble uploading to the 3FC gallery, so I've taken Dawnyal's suggestion to use Photobucket. 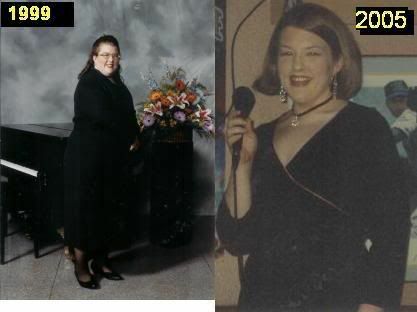 The first photo is my original baglady "before" pic at 247 lbs , the second was taken a couple of weeks ago at 197. ETA: After dropping another 20 to get down to 177 pounds, I've managed to climb all the way back to where I started! Now I'm ready to get it all off again, once and for all. me at about 185 - progress! I know this isn't a great picture and my gut is somewhat hanging out..lol..BUT...a friend sent me this picture and for one of the first times in my life.....I looked at the picture and said..."my gosh..I"m almost pretty". This is really huge for me...seriously, it is!!!! Oh..in case you are wondering why I'm dressed so weird.....I had a surprise 30th b-day party for my husband with a Dukes of Hazzard theme. Everyone dressed up in dukes gear...my shirt is a vintage late 70's cowgirl shirt..lol. Ok...I just wanted to share this pic. I've been looking at all the other pics and everyone looks AMAZING....awesome job!!!!!!!!! Oh...I hope this picture or attachment thing works..I've never done it before...eeek???? Well, I've reached the 75lb. mark so I wanted to share a couple of more pics. The first 2 were taken in May of last year at my highest of about 240. The others were taken today (except of the one with my hubby which was taken a few weeks ago). Dee, you look gorgeous! Congratulations on your hard work! My DH took a photo of me in Maui a couple of days ago that was okay so I thought I'd do a side-by-side comparison. This is at 84 lbs. lost, although I realize I named the photo 82 lbs. lost. Since I just got back from vacation, I'm betting it's probably now 82 lbs. 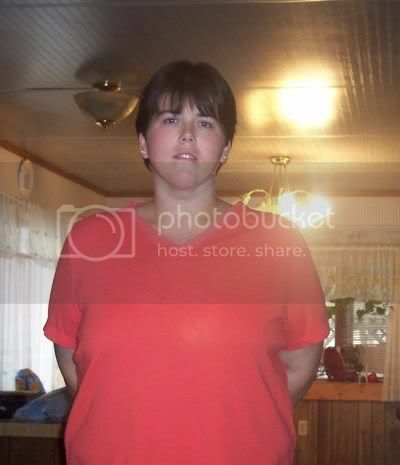 lost instead of 84 lbs. lost. I wish what happened in Maui stayed in Maui, but I'm afraid what happened in Maui is now on my hips. . . The last two pictures are now (about 220). The black dress I'm wearing now was the dress I was targeting to get back into. I bought it a number of years ago and loved it. It was the first thing I grew out of, and I'm thrilled to be back in it. I have an event to wear it at next month, too! So, boy, you can really see a difference in my face! And I have a waist again! I wasn't going to do any more progress pics until I reached my goal, but a co-worker took this pic this morning and I was kinda pleased with the way it turned out. I've put it next to my starting pic. I can see a difference now. No more tree trunk legs!!!!!! Oh...I hope these attachments work....eeek?